Having a close friend or loved one officiate your wedding is an increasingly popular trend. 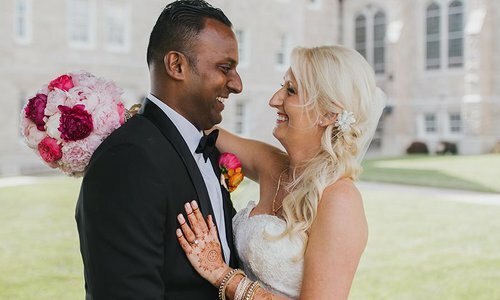 When our editorial art coordinator was asked to officiate her friend’s wedding, she didn’t know where to begin. 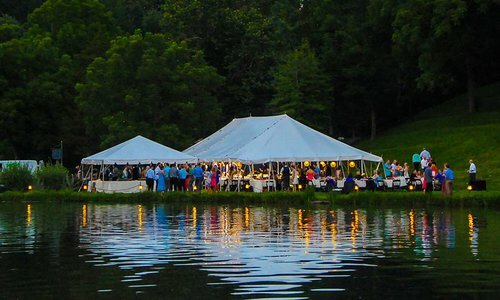 Learn what it takes to officiate a wedding. I met Lauryn when I was a freshman at Missouri State University. We were suitemates. She was a sophomore, and she laughed more than anyone I’d ever known, and I felt my funniest when I was around her. We bonded over reality TV and boys and ended up dating guys in the same friend group, and though those relationships are long gone now, our friendship has endured. When Lauryn Jost (nee Glass) asked me to officiate her wedding, I was honored and excited. I love love, and I loved the idea of performing the ceremony that would unite two of my friends in matrimony. However, I quickly realized I better do my homework if I didn’t want to risk messing up my best friend’s big day. A lot of planning went into making the ceremony happen, but in the end it was a huge success, even if we hit a few minor bumps along the way. The first thing to do is make sure you can legally perform the wedding. The laws governing who can marry someone vary by state, and in some cases, by county. You’ll either need to become a temporary officiant or become ordained. In Missouri being ordained online is typically just fine. However, to be on the safe side, call the county clerk’s office where the ceremony is taking place to make sure. 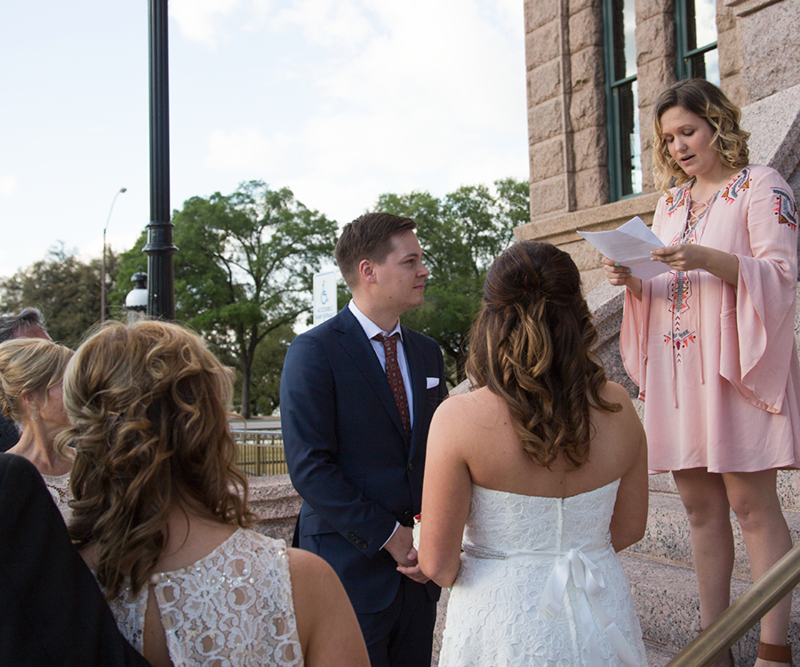 Lauryn and Zak were getting married in Fort Worth, Texas, which had similar requirements to Missouri, so the first thing I needed to do was become ordained. Becoming ordained is surprisingly easy. 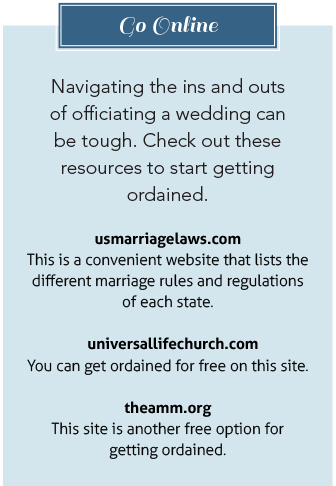 There are multiple websites where you can do this, but a friend who had officiated several weddings suggested going through the Universal Life Church Monastery, which is free. A few clicks of the mouse and a certificate of authentication was delivered straight to my inbox. When it comes to the actual ceremony, make sure to keep the couple’s vision in the forefront of planning. Lauryn and Zak wanted their wedding to be personal, and we worked together over email to craft a ceremony tailored to their tastes. 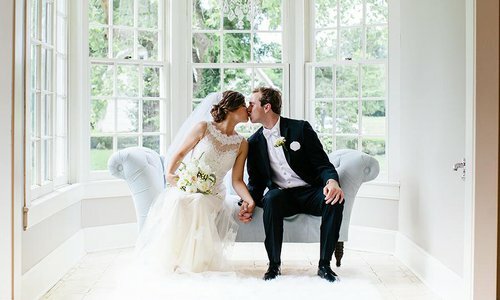 They came up with the basic structure, which included fun anecdotes and traditional vows. 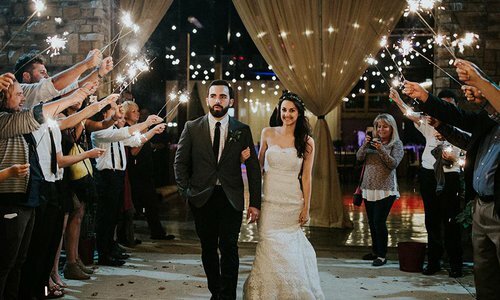 I sent them separate lists of questions about each other and their relationship and used the answers to help create the portion of the ceremony that would typically be filled with a sermon. Once I had the finished product written out, I sent it back to the couple to make sure they were happy with the final version. The result was a ceremony filled with lots of personal touches that didn’t stray too far from tradition. One thing that made me nervous going into the wedding was the fact that we weren’t going to have an opportunity to have a wedding rehearsal. To make sure I was as prepared as I could be, I took my written draft and practiced the ceremony multiple times to become familiar with it. I didn’t have it completely memorized, but I knew it well enough that I could look up periodically throughout the service and not trip over my words. Lauryn had made me a hair appointment, which had seemed unnecessary at first, but I ended up being happy she did. You have to remember that you will be in some of the wedding photos, and you want to look your best. I had discussed my choice of dress with Lauryn ahead of time, but in retrospect, I wish I would have sent her a picture of it. It turned out my dress was a bit more casual than the rest of the wedding party. In the end it wasn’t a huge deal, but the devil is in the details. My last official act of the day was to sign the marriage license, a small but important duty. Overall, the ceremony went smoothly, and officiating the wedding of a dear friend is an experience I’ll never forget.